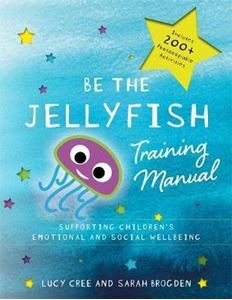 The Be the Jellyfish programme is designed to support schools in nurturing the social and emotional wellbeing of children in their care. The Be the Jellyfish programme is designed to support schools in nurturing the social and emotional wellbeing of children in their care. The lessons are structured around sensory relaxation and include relaxing exercises in breathing, visualisation, and massage. Based on their experiences teaching in primary schools, the creators were inspired to develop a programme that focusses on a child's specific social and emotional needs in order to fulfill their learning potential. Structured as one hour lesson plans, the activities included encourage children to relax, communicate and explore themselves creatively using art materials, peer massage, visualisation, bodywork, breathing, sensory equipment and mindfulness. This manual contains planning ideas for lessons, visualisation scenarios, illustrated bodywork exercises, photocopiable templates and posters to use in the classroom or one on one with a child.